Every year since I've been able to crochet I've made myself a new pair. 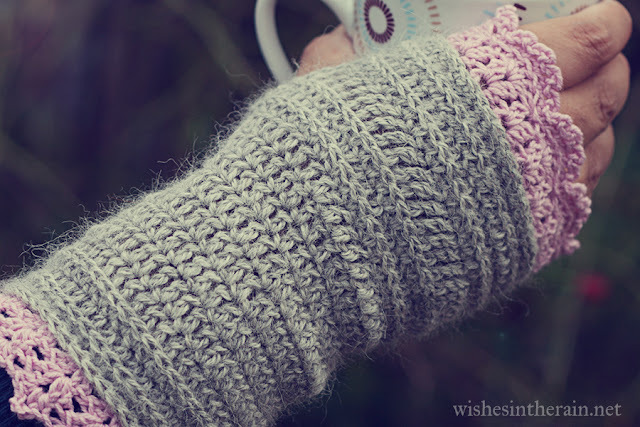 Normally I lose my wrist warmers during the summer (I think somewhere there must be a stash of them in my house that I can't find). Although this year was an exception, and I do still have my wrist warmers from last year, I wanted some new ones anyway. A girl can never have too many accessories, right? 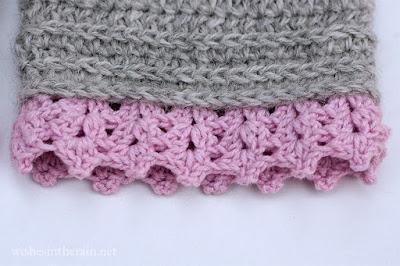 Recently, I have become interested in 3rd loop hdc stitches. 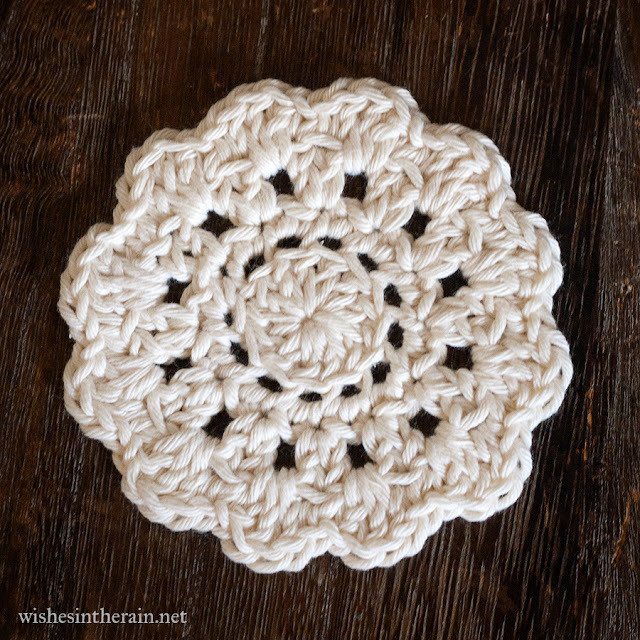 I love how they add a little bit of dimensional texture to a flat piece of crochet, and how they're like knitting, but not quite the same. I also felt that I need some pink, and some lace... and A Kingdom Far, Far Away was born. I made these for me, to be the perfect shape and length, but you can make them for you too with just a bit of work. There are some more advanced stitches here, for example the third loop hdc, foundation hdc, and chainless starting dc, but don't be put off - they're easy to learn, I'm linking tutorials, and some, like the chainless starting dc, can change a lot of your projects for the better (seriously it is that good of a stitch). You will have to work out the number of stitches for the size you want, but I've tried to make it as straightforward as possible. I have only made these once so apologies in advance for any errors! My gauge was 42hdc = 8in/20cm. 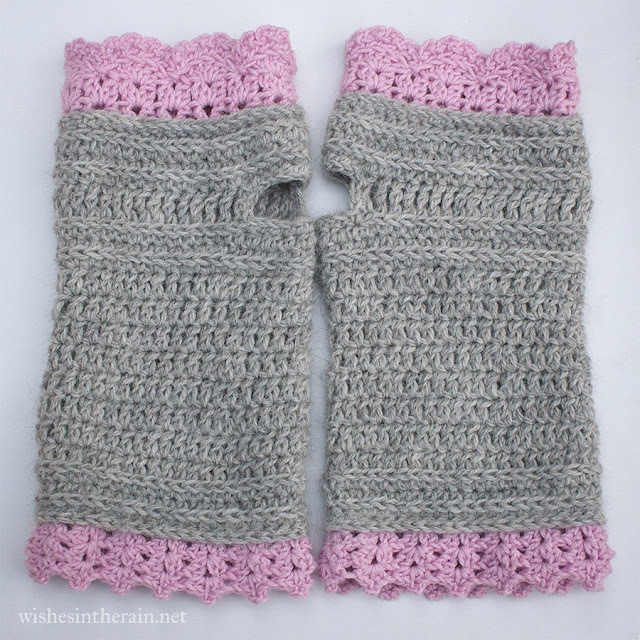 My wrist warmers/fingerless gloves were 9in (23cm) long - around 7in (18cm) for the main section and 1in (2.5cm) each for the top and bottom borders. Don't worry if you can't make gauge, just make the size that fits you. I have only worked out the number of stitches for a large size. However, you can make a smaller/different size if you're not afraid of a little arithmetic. All increases and decreases (apart from increase in round 18 if you don't have a multiple of 6 sts) are optional - if you're making these for yourself, do what fits you best. Also feel free to add or subtract rounds between Round 5 and Round 11 to get the length you would like. The left and right wrist wamers (right and left if you're left handed) are slightly different. Follow the right/left guidelines depending on which one you're making. Yarn B: around 44yards/40m 4ply with 3mm hook. I used Rowan Wool Cotton 4ply in pink. Stitches used (In US terms throughout): sc, hdc, dc, trc, foundation hdc (fhdc), 3rd loop hdc, chainless starting dc, dc mini cluster (see below), picot (see below). dc mini cluster: yarn over, pull up loop, yarn over, pull through 2 loops, yarn over, pull up loop (4 loops on hook), yarn over, pull through 2 loops, yarn over, pull through 3 loops. picot: ch3, sl st into first ch. Foundation: 42 (or a multiple of 3 that fits around your arm) fhdc, join with a sl st to make a circle (make sure it doesn't twist). Round 18: ch1, normal hdc in each st around. Join with a sl st to first hdc. (42) If this row is not a multiple of six, increase by three. Round 20: ch1, sc in each st around. Join, bind off & weave in ends. Left: join in bottom right corner of thumbhole (near seam). Work 8sc across bottom, 3 sc along trc, 8 sc across top in ch sts, 3 sc along trc, join with sl st into first sc. Bind off & weave in ends. Right: join in top left corner of thumbhole (near seam). Work 8sc across top in ch sts, 3 sc along trc, 8 sc along bottom, 3 sc along trc, join with sl st into first sc. Bind off & weave in ends. Round 1: Chainless starting dc, ch1, dc in same st, skip 2 sl sts, *(dc, ch1 dc) in same sl st, skip 2 sl sts* 13 times, join with sl st to starting dc. Round 2: sl st into ch space, ch2, dc (counts as first dc mini cluster), ch1, dc mini cluster, *(dc mini cluster, ch1, dc mini cluster) in next ch space* 13 times, join with sl st into top of first dc. Round 4: in back loops, sc in first dc, (ch3, sc,) 4 times, skip sl st, *sc, (ch3, sc) 4 times, skip sl st* six times, join to first sc, bind off and weave in ends. Round 3: sl st into second dc, s sl into space between 2nd and 3rd dcs. Ch 1, *(2hdcs, picot, 2hdcs) into space between 2nd and 3rd dcs* 14 times, join, bind off, weave in ends. This is my last snowflake wish for now - it turns out I need to crochet other things like Christmas presents and baby blankets and some fingerless gloves which I hope share with you soon. This is the pattern I go to if I want a larger snowflake, even though it is only four rounds of crochet. Although it may look complicated it's actually quite simple and only uses basic stitches. This snowflake is about 9cm (3.5in) when made in dk with a 2.75mm (C) hook, or about 12cm (4.7in) in worsted with a 3.5mm (E) hook. As always I block all my snowflakes with a mixture of PVA glue, water and glitter to make them stiffer and sparkly. I feel this pattern is particularly in need of blocking. You can read my snowflake blocking instructions. optional materials for blocking: water, PVA glue and glitter, or spray starch. US: ch, sl st, sc, hdc, dc. UK: ch, sl st, dc, htr, tr. Round 4: sl st in first 4 sts up to ch 3 space, *(sc, ch3, sc, ch5, sc, ch3, sc) in ch3 loop, ch3, skip sts to next ch3 loop* six times, sl st in first sc of round. Bind off, weave in ends, block. Round 4: sl st in first 4 sts up to ch 3 space, *(dc, ch3, dc, ch5, dc, ch3, dc) in ch3 loop, ch3, skip sts to next ch3 loop* six times, sl st in first dc of round. Bind off, weave in ends, block. A childhood friend of mine became a father for the first time this summer, and, since I was going to see his parents today, I thought it would be nice to make a hat for his baby. 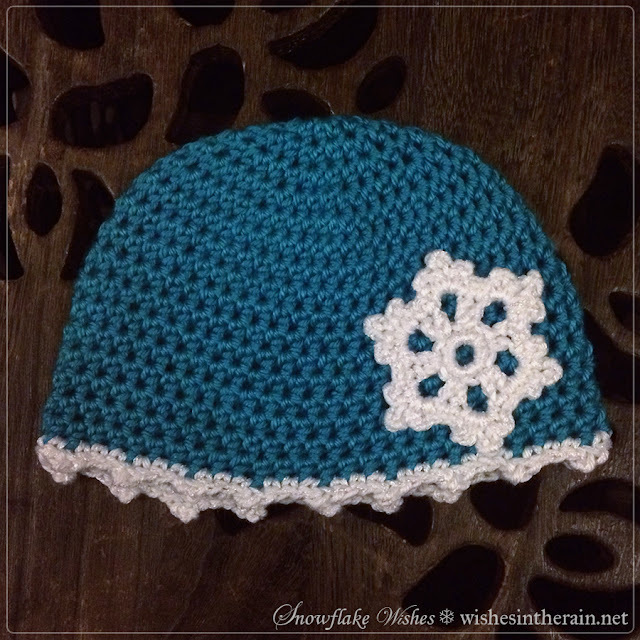 Since I'm all about snowflakes right now it was easy to decide what type of hat to make! I used Elizabeth Roggasch's Half Double Crochet Beanie as a base for the hat. Hdcs are my favourite stitch to use for a hat because it doesn't take too long to grow, they have give, and they're really easy to attach things to afterwards. This is a really nice pattern because it gives measurement guidelines so you know even if your gauge is off (mine always is) that your hat will be the right size. I used Caron Simply Soft yarn in Blue Mint for the main body of the hat. I used White in the same yarn for the edging and snowflake, held together with Twilleys of Stamford Goldfingering in white. It's hard to see from the photo, but it gives it a little bit of sparkle.For more information on specific yarns etc, see my project on Ravelry. I intended to make the 3-6 month size, but lost concentration and wound up with 54 stitches on round 6 instead of 50. However, I have tight tension and when I measured it seemed to be the correct size (even though it wound up being the 6-9month size as written). Also I wanted to end up with a multiple of three stitches on the last round. The other main modification I made was working in a spiral rather than rounds; this meant I avoided having a seam. I finished up with a border of scs in white with a picot (ch3, sl st into first ch) every three stitches. 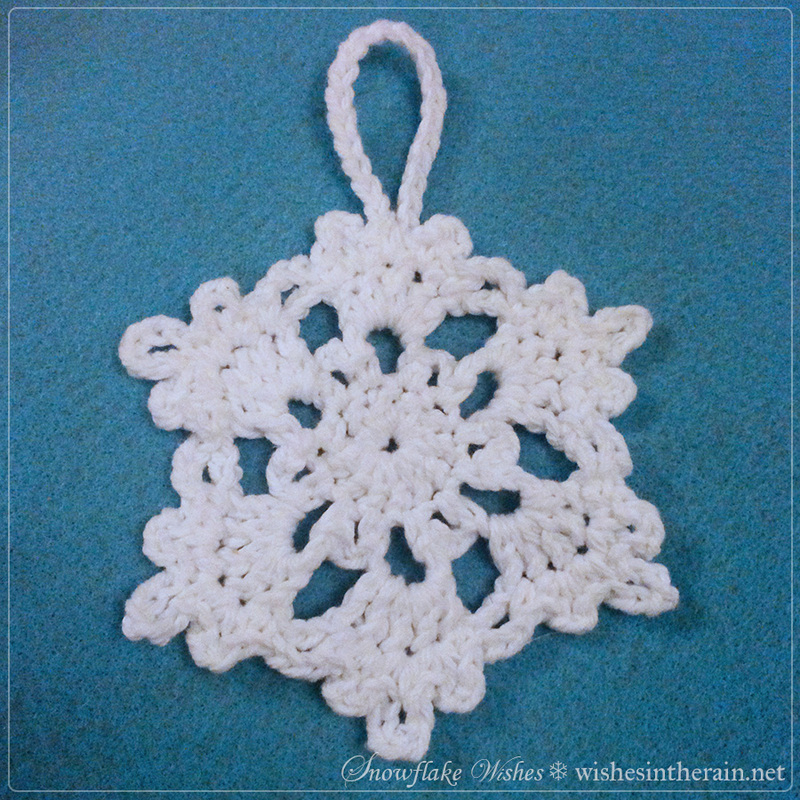 For the snowflake, I used a 3.5mm hook to make my Snowflake Wishes 2 snowflake. I sewed it on to the hat making sure to sew down the ch5s from the snowflake to the hat to prevent it from curling. Christmas is getting closer, and I know a lot of you will have put your trees up already. I really enjoy seeing other peoples trees and lights as I travel after dark, though I don't think I'll put my tree up for a little while. 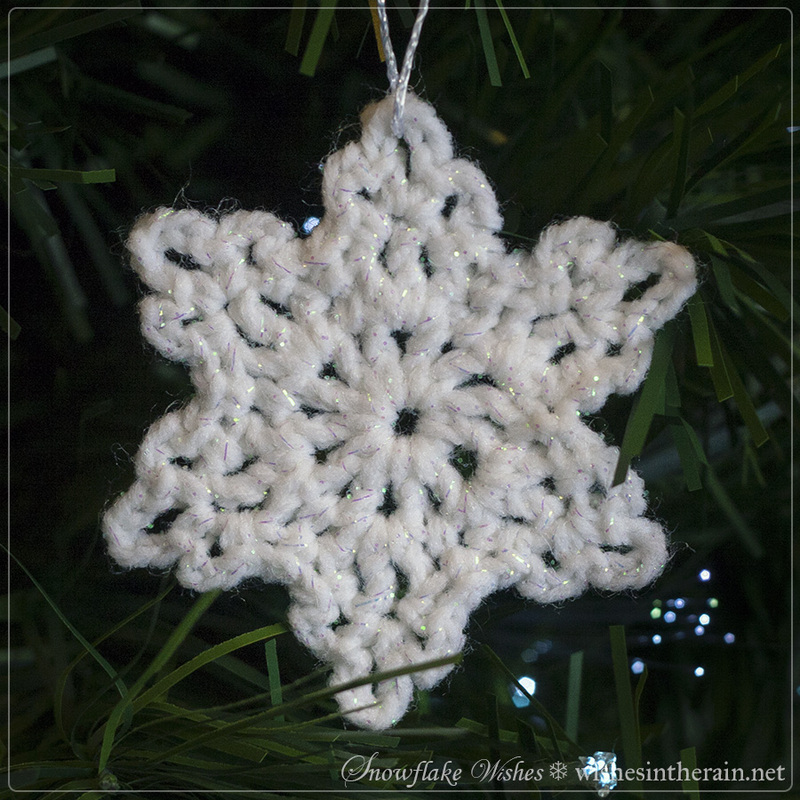 If you're still looking for decoration inspiration, though, here's another snowflake! This is actually the first one I designed a few years ago. 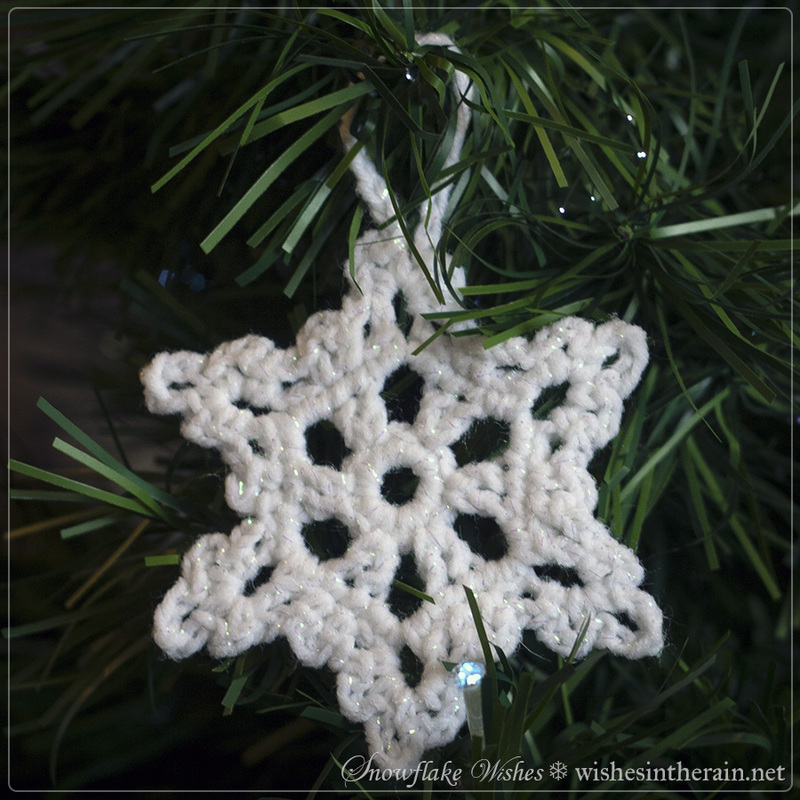 I like it because there are only three rounds so it's simple and fast to crochet, and I finish sooner than I think I'm going to. 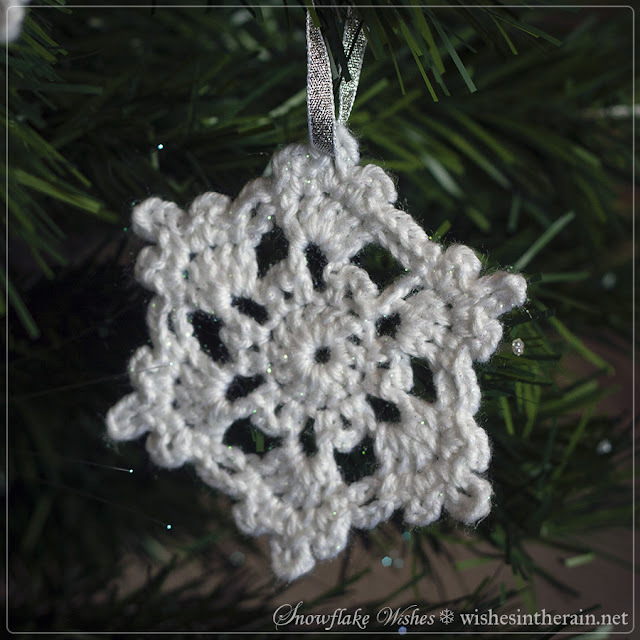 This snowflake is around 7cm (2.75in) across when made with dk yarn and a 2.75mm (C) hook, and 9cm (3.5in) when made with worsted weight yarn and a 3.5mm (E) hook. As always I block all my snowflakes with a mixture of PVA glue, water and glitter to make them stiffer and sparkly. You can read my snowflake blocking instructions. US: ch, sl st, sc, dc, trc. Optional, chainless starting dc. UK: ch, sl st, dc, tr, dtr. Optional, chainless starting treble (see link above for explanation in US terms). Ch5, join with sl st to form a loop. Round 1: ch 4 (counts as 1 dc and one ch - alternatively, starting dc, ch1), *dc, ch1* into loop 11 times, join with sl st to 3rd chain of ch4 (or top of starting dc). Round 2: sl st into first ch1 space, *dc, ch1, trc, ch1, dc in next space, sc in next space* 5 times, dc, ch1, trc, ch1, dc in next space, join with sl st to first sl st in round. Round 3: *ch1, skip dc, sc into ch1 space, ch3, sc into trc, ch5, sc into same st, ch3, sc into ch1 space, ch1, skip dc, sc into sc* five times, ch1, skip dc, sc into ch1 space, ch3, sc into trc, ch5, sc into same st, ch3, sc into ch1 space, ch1, skip dc, sl st into sl st on previous round. Bind off and weave in ends. Round 1: ch 4 (counts as 1 tr and one ch - alternatively, starting tr, ch1), *tr, ch1* into loop 11 times, join with sl st to 3rd chain of ch4 (or top of starting tr). Round 2: sl st into first ch1 space, *tr, ch1, dtr, ch1, tr in next space, dc in next space* 5 times, tr, ch1, dtr, ch1, tr in next space, join with sl st to first sl st in round. Round 3: *ch1, skip tr, dc into ch1 space, ch3, dc into dtr, ch5, dc into same st, ch3, dc into ch1 space, ch1, skip tr, dc into dc* five times, ch1, skip tr, dc into ch1 space, ch3, dc into dtr, ch5, dc into same st, ch3, dc into ch1 space, ch1, skip tr, sl st into sl st on previous round. Bind off and weave in ends. US/UK: for a self loop snowflake: replace one ch5 on last round with ch20-25 to make a loop. 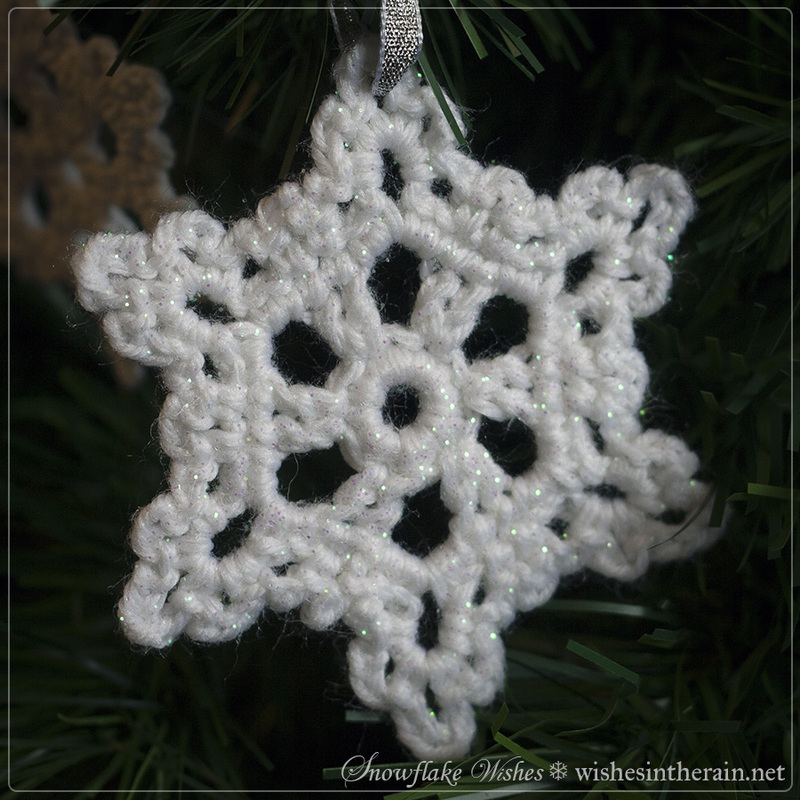 This snowflake is quite small - about 6.5cm (2.5in) when made in dk with a 2.75mm (C) hook, or about 9cm (3.5in) in worsted with a 3.5mm (E) hook. US: ch, sl st, sc, dc mini cluster (see below). UK: ch, sl st, dc, tr mini cluster. Ch 5, join with a sl st to form a ring. Round 2: sl st into first ch3 loop, sc ch3, *sc into next loop, ch3* five times, join with sl st into first sc. Round 3: ch3, dc mini cluster in ch3 space, ch3, *sc in sc, ch3, dc mini cluster in ch3 space, ch3,* five times, join with sl st into first stitch. Round 4: *3sc in chain 3, sc, 3ch, sc in top of dc cluster, 3sc in next ch 3* 6 times. Join with sl st into first sc. Bind off, weave in ends and block. Round 2: sl st into first ch3 loop, dc ch3, *dc into next loop, ch3* five times, join with sl st into first dc. Round 3: ch3, tr mini cluster in ch3 space, ch3, *dc in dc, ch3, tr mini cluster in ch3 space, ch3,* five times, join with sl st into first stitch. Round 4: *3dc in chain 3, dc, 3ch, dc in top of tr cluster, 3dc in next ch 3* 6 times. Join with sl st into first dc. Bind off, weave in ends and block. US/UK: For a self loop snowflake: replace a ch5 in Round 4 with ch 20 or ch 25. 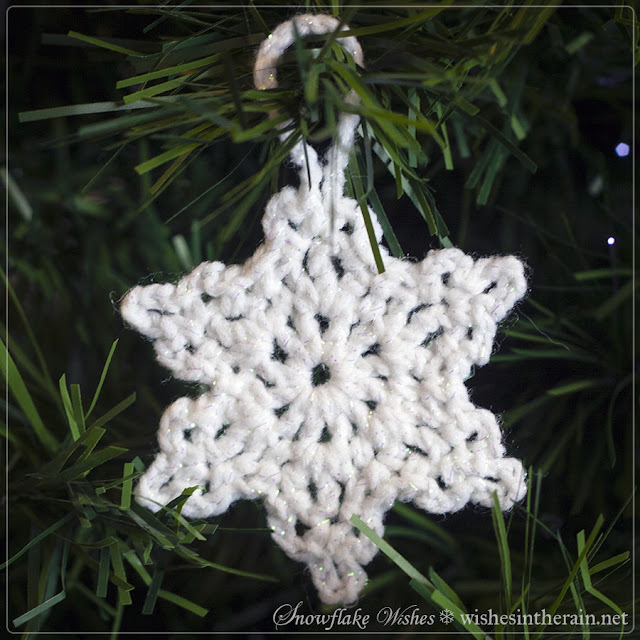 The original version is around 8.5cm (3.3in) from point to point when made with dk weight yarn (Sirdar Snuggly Pearls) and a 2.75mm (C) hook. It's around 10cm (4in) across with worsted (Lily Sugar'n Cream) and a 3.5mm (E) hook. 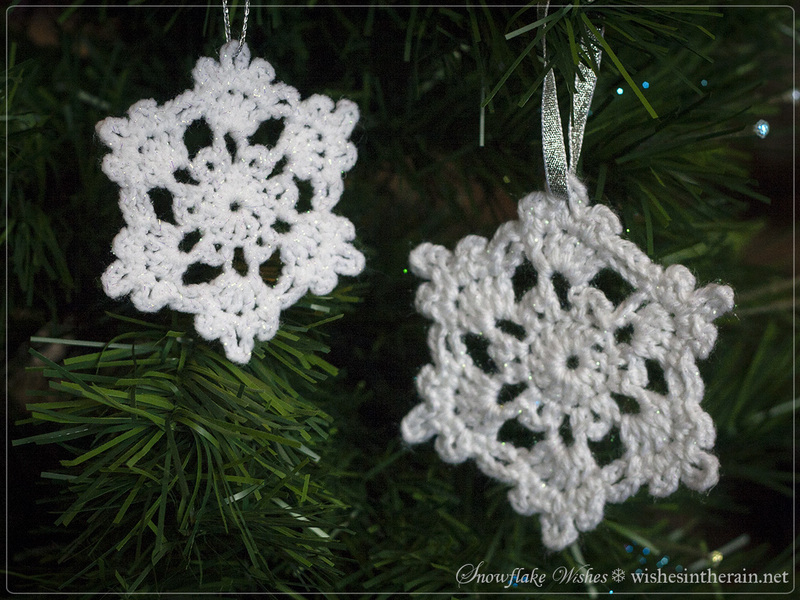 I love the second version because it's super fast to make but it's still cute and snowflake-y. This version is 7cm (2.75in) from point to point when made with dk and a 2.75mm (C) hook, and 8cm (3.1in) across with worsted and a 3.5mm (E) hook. US: ch, sl st, sc, dc. Optional, chainless starting dc. UK: ch, sl st, dc, tr. Optional, chainless starting treble (see link above for explanation in US terms). Round 1: ch1, sc 12 times into loop, join with sl st to first sc. Round 2: ch3 (or chainless starting dc), dc in same st, ch3, skip st, (2dcs in next st, ch 3, skip st) 5 times, join last ch3 into 3rd ch of first ch3/starting dc. Round 3: ch1, sc in next dc, (2sc, ch5, 2sc) in ch3 space, *sc in next two dcs, (2sc, ch5, 2sc) in ch3 space* five times, join with sl st in ch1 at start of round. Round 4: *ch3, sc in next sc, ch2, skip 2 scs, (sc, 3ch, sc, ch5, sc, 3ch, sc) in ch 5 space, ch2, skip 2 scs, sc in sc* five times, *ch3, sc in next sc, ch2, skip 2 scs, (sc, 3ch, sc, ch5, sc, 3ch, sc) in ch5 space, ch2, sl st into sl st on previous round. Bind off, weave in ends, block. Alternate Round 3: ch1, sc in next dc, (sc, ch3, sc, ch5, sc, ch3, sc) in ch space, *sc in next two dcs, sc, ch3, sc, ch5, sc, ch3, sc) in ch space, join with sl st in ch1. Bind off, weave in ends, block. Round 1: ch1, dc 12 times into loop, join with sl st to first dc. Round 2: ch3 (or chainless starting tr), tr in same st, ch3, skip st, (2trs in next st, ch 3, skip st) 5 times, join last ch3 into 3rd ch of first ch3/starting tr. Round 3: ch1, dc in next tr, (2dc, ch5, 2dc) in ch3 space, *dc in next two trs, (2dc, ch5, 2dc) in ch3 space* five times, join with sl st in ch1 at start of round. Round 4: *ch3, dc in next dc, ch2, skip 2 dcs, (dc, 3ch, dc, ch5, dc, 3ch, dc) in ch 5 space, ch2, skip 2 dcs, dc in dc* five times, *ch3, dc in next dc, ch2, skip 2 dcs, (dc, 3ch, dc, ch5, dc, 3ch, dc) in ch5 space, ch2, sl st into sl st on previous round. Bind off, weave in ends, block. Alternate Round 3: ch1, dc in next tr, (dc, ch3, dc, ch5, dc, ch3, dc) in ch space, *dc in next two trs, dc, ch3, dc, ch5, dc, ch3, dc) in ch space, join with sl st in ch1. Bind off, weave in ends, block. US/UK: For a self loop snowflake: replace a ch5 (in Round 4 or Alternate Round 3) with ch 20 or ch 25. No matter what the forecast is for the UK as a whole, Wishes in the Rain very rarely becomes Wishes in the Snow, even if it's snowing in the hills nearby. 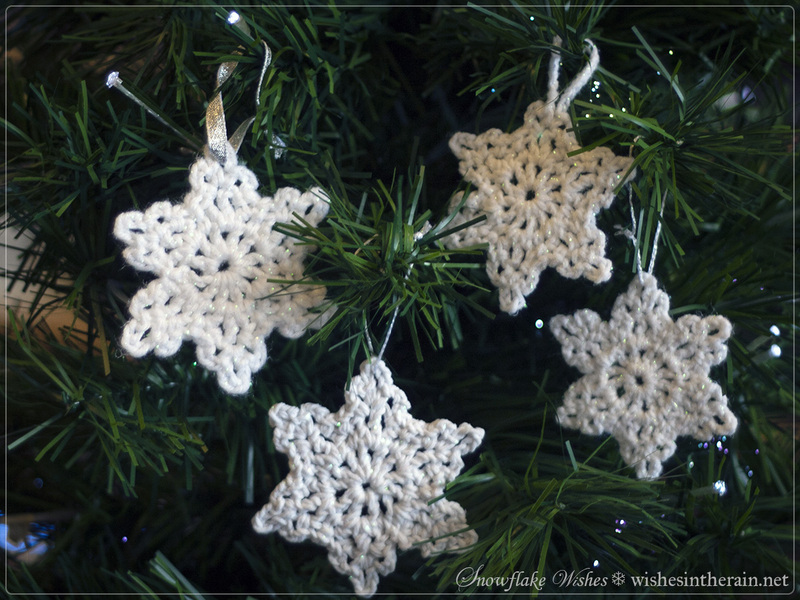 However, I have crochet, and crochet snowflakes are not as cold! 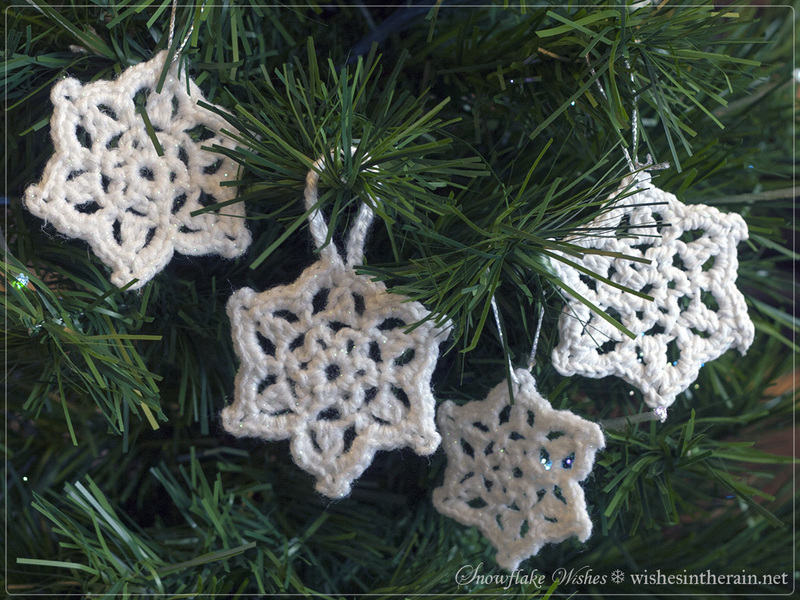 They're also perfect to decorate your Christmas tree or to give away to friends. 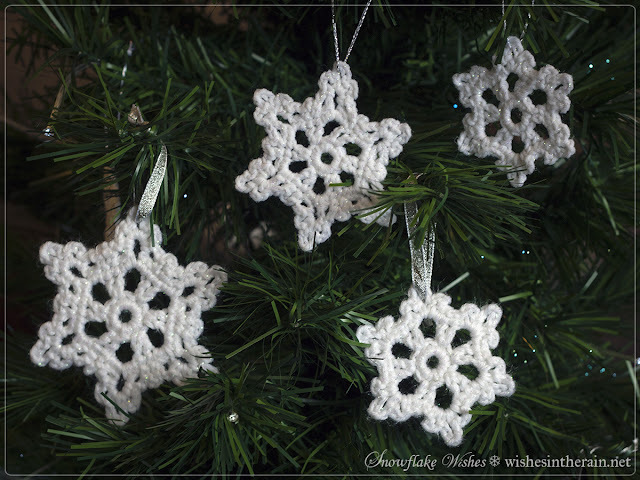 I first crocheted snowflakes to put in Christmas cards a couple of years ago, and very soon I found myself making up patterns for them. I love looking at thread snowflakes but I wanted things that would be quick to make, so if I had a few minutes here or there I could get one finished, so these patterns are simple, easy to make, and written with dk, worsted and aran weight yarn in mind. 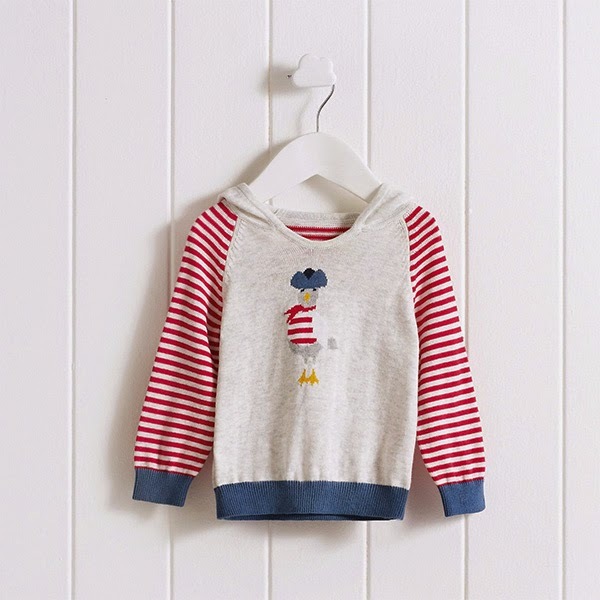 You can make them with a wide range of hooks and yarn combinations. 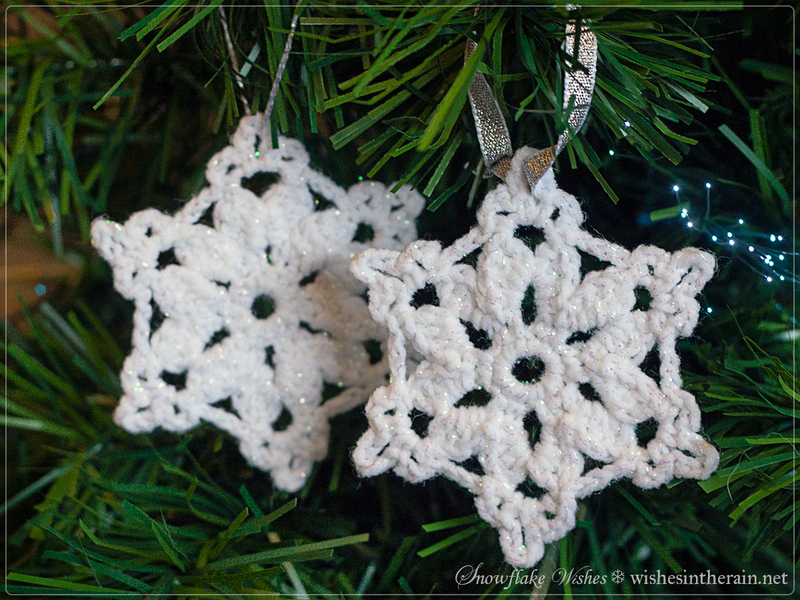 The snowflakes pictured above are dk with a 2.75mm (C) hook on the left and is about 9cm (3.5in) from point to point, and worsted with a 3.5mm (E) hook on the right, about 11cm (4.5in) from point to point. Any type of yarn will work for snowflakes; personally I like yarns that come with some sparkle for example Sirdar Snuggly Pearls. 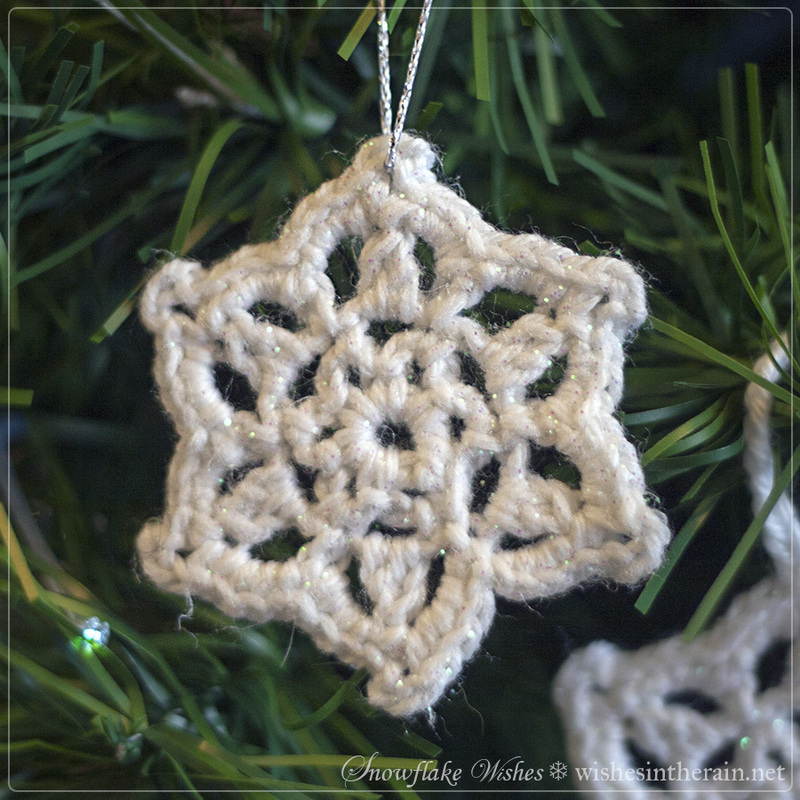 Depending on your yarn and hook size combination you may need to block the snowflakes. I always block them, even if they do come out flat, with a mixture of water and PVA glue to stiffen them, and to add glitter. Round 1: ch3 (or make chainless starting dc), dc 11 times into loop, sl st into 3rd ch of ch3/starting dc to join. Round 2: ch5, sc in next st, ch3, *sc into next st, ch5, sc in next st, ch3* five times, sl st into first st to join. Round 3: sl st into first ch5 loop, ch3 (or make chainless starting dc), dc4, ch3, skip ch3 loop, *dc5 in next loop, ch3, skip ch3 loop,* 5 times, sl st into 3rd ch of ch3/starting dc to join. Round 4: Ch1, (sc, ch3, sc,) in next st, (sc, ch5, sc,) in next st, (sc, ch3, sc,) in next st, sc, ch3, *sc in next st (skip ch3 from prev round), (sc, ch3, sc) in next st, (sc, ch5, sc) in next st, (sc, ch3, sc) in next st, sc, ch3,* five times, join with sl st to ch1 at start of round. Bind off, weave in ends. Round 1: ch3 (or make chainless starting tr), tr 11 times into loop, sl st into 3rd ch of ch3/starting tr to join. Round 2: ch5, dc in next st, ch3, *dc into next st, ch5, dc in next st, ch3* five times, sl st into first st to join. Round 3: sl st into first ch5 loop, ch3 (or make chainless starting tr), tr4, ch3, skip ch3 loop, *tr5 in next loop, ch3, skip ch3 loop,* 5 times, sl st into 3rd ch of ch3/starting tr to join. Round 4: Ch1, (dc, ch3, dc,) in next st, (dc, ch5, dc,) in next st, (dc, ch3, dc,) in next st, dc, ch3, *dc in next st (skip ch3 from prev round), (dc, ch3, dc) in next st, (dc, ch5, dc) in next st, (dc, ch3, dc) in next st, dc, ch3,* five times, join with sl st to ch1 at start of round. Bind off, weave in ends. Here are some photos of what your snowflake should look like after each round. For this one I've used Caron Simply Soft yarn and a 3.5mm hook. 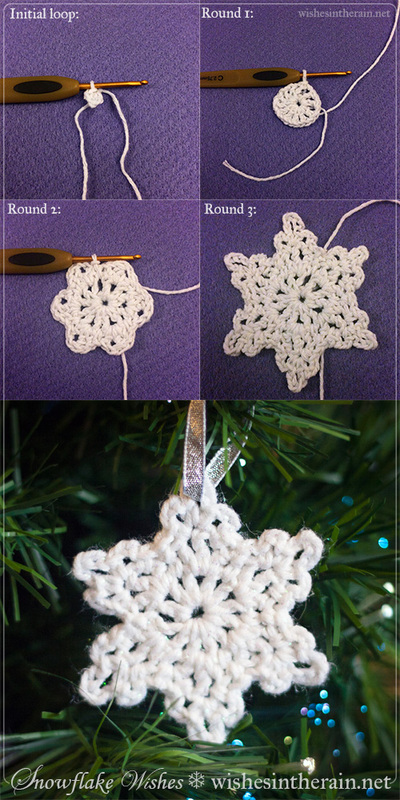 US/UK: Round 4 alternative (for self-loop snowflake): Replace one ch5 with ch20 or ch25 to make a large loop. Make rest of round as normal. Blocking with PVA and glitter is messy but to my mind, worth it. Here's a picture of the steps I go through, followed by an explanation. 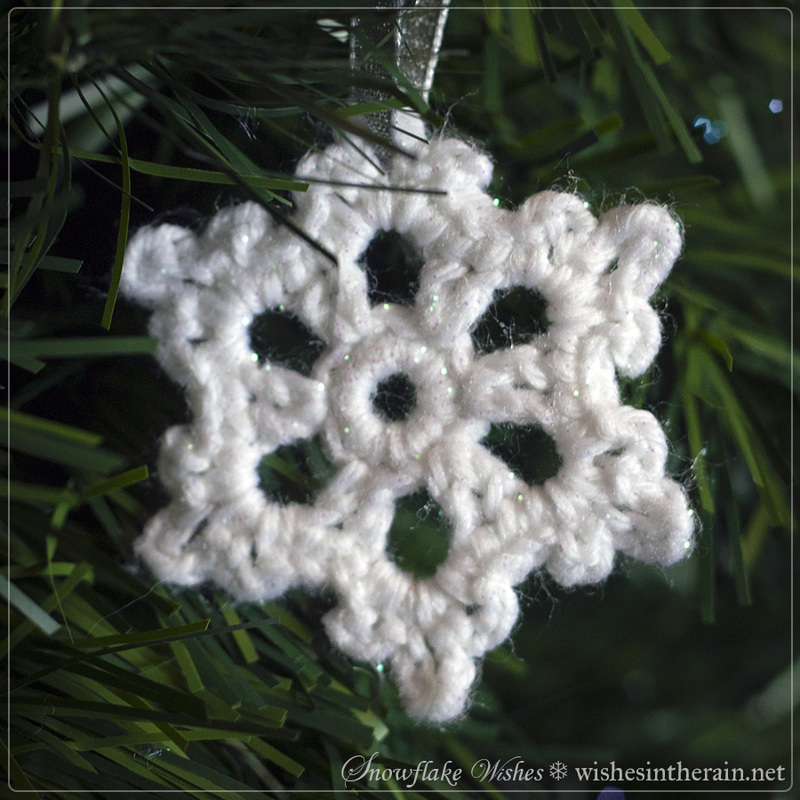 Of course, you can leave your snowflakes unblocked or block them with spray starch instead. 1. I make sure I've sewn in all the ends etc before blocking snowflakes, and sort out ones that are self-looping to one side so I don't accidentally get the loops glue-y. I also prepare my workspace with some cling film so as not to glue glitter to surfaces in my living room, and I put cling film over a tray to hold the snowflakes while they dry. It may also be wise to have some kitchen roll to hand to mop up any spills. 2. I use Mod Podge but you can use any PVA glue. The glitter I have was sold as flower glitter in Hobbycraft a few years ago. I like it because the flakes are a little larger than most glitters. I think this technique works much better with iridescent glitter than metallic glitter, because when it's not catching the light metallic glitter looks like little black spots on the snowflakes, but iridescent glitter is harder to see. 3. I use those plastic boxes you get takeaway food in to mix my glue and water, but you can use anything you don't mind cleaning that is big enough to fit your largest snowflake in comfortably. I can't give exact amounts of how much glue and water to use, but it's around 50-50. 4: With glitter, more is more. I start off with a generous amount but keep finding myself adding more. 5. Mix the glue and water well. The resulting liquid will be very runny, not unlike cream. 6. Dunk a snowflake in the mix, and squish it with a spoon to make sure the mix soaks through. 7. Squeeze out the excess mix. I do this in my hands and don't wear gloves, so this is the messy part for me. 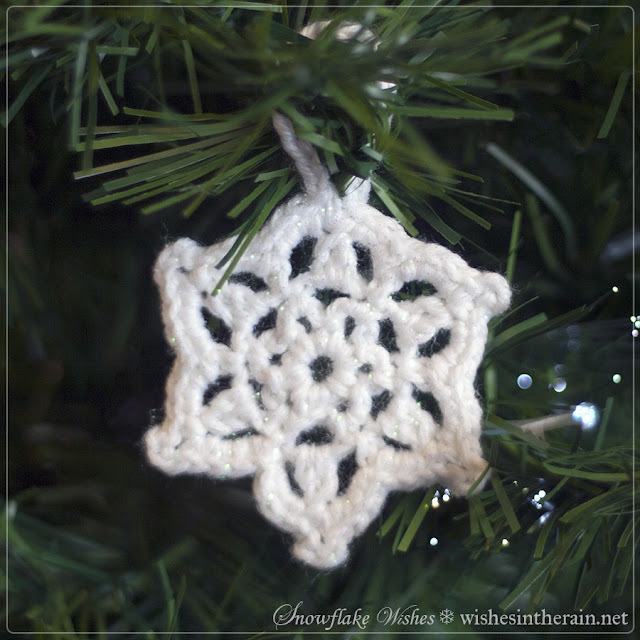 Be aggressive - you don't want any bubbles of mixture forming in the holes in the snowflake. 8. 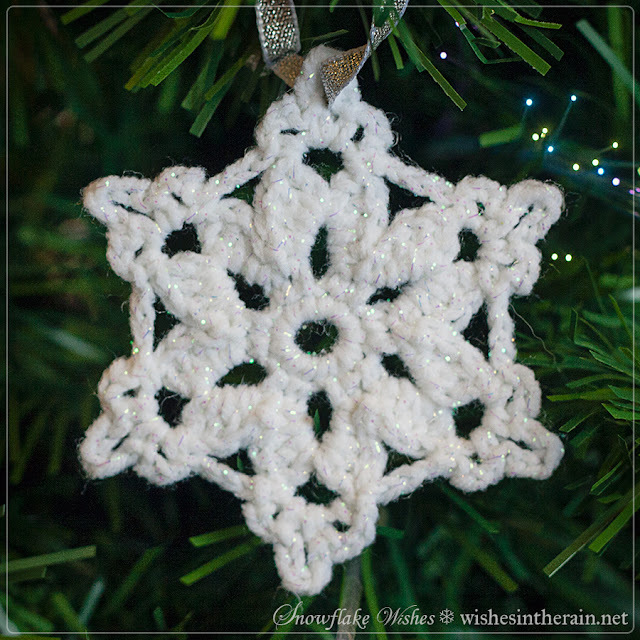 Pull the snowflake back into shape, and lay out on the cling film to dry. You could pin it out if like and have a surface that you don't mind getting a bit gluey- maybe old foam? I got about 14 snowflakes of different sizes done in that one box of mix pictured above. If you're running low, add a bit more water, glue, and glitter. Leave for at least a couple of days and then carefully peel the snowflakes off the cling film. Most of them don't stick but the occasional one may. If you have made self-loop snowflakes, follow the same procedure but make sure not to get the loop wet or it will harden and be more difficult to use. For these, it's better to squeeze them flat in a folded piece of kitchen roll before reshaping and putting out to dry. I used silver ribbon, and crochet thread to make loops to hang the snowflakes. The brands I used were Anchor Artiste Metallic thread in silver and Twilleys of Stamford Goldfingering in white. Where the holes in the snowflakes were smaller I used a needle to get the thread through. Burlap/hessian string might look nice, or twine. I have tried silver elastic but found it wasn't cost effective when purchased by the metre from the local haberdashery. Hello. My name is Joanna, and I am addicted to designing coasters. In my defence, my cousin got married and although he and his wife said they didn't want presents, I couldn't resist making a little something! 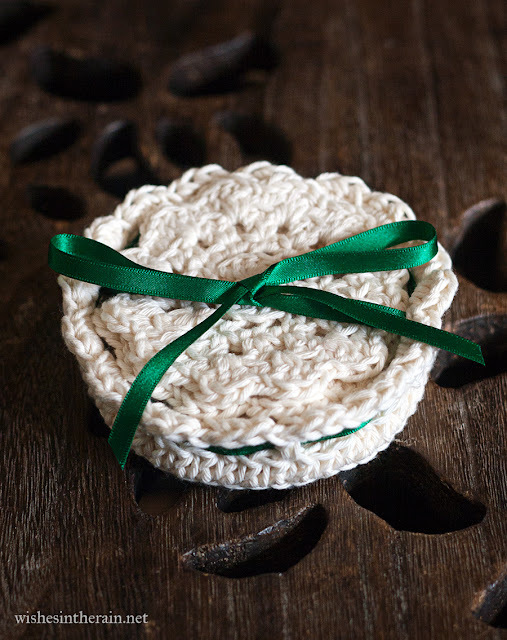 These coasters have a matching holder, fastened with ribbon. Alternatively you could chain a length of yarn in a contrasting colour, or leave off the ties altogether. 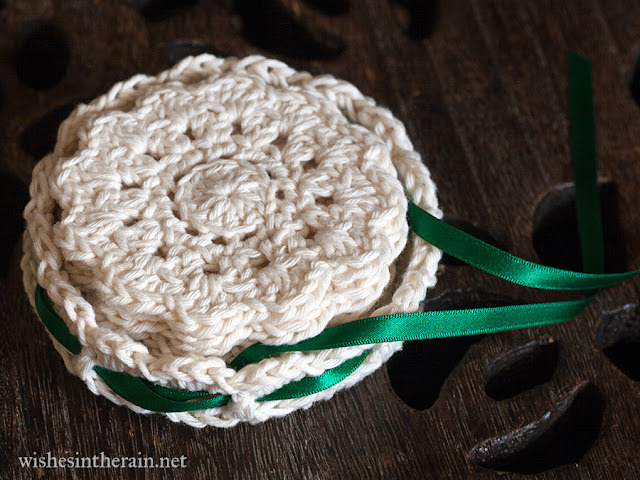 The coasters are10cm/4in across when made in Sugar'n Cream, and 9cm/3.5in across when made with Rico Creative Cotton Aran, using a 4.5mm hook. Worsted/aran weight cotton yarn, for example Lily's Sugar'n Cream, or Rico Creative Cotton. For one coaster you will need about 11m/12 yards of yarn. For the holder you will need about 24m/26 yards. For a full set you'll need around 92m/100yards of yarn in total. Stitches used: ch, sl st, sc, hdc, dc, magic ring, chainless starting dc (this stitch is a bit tricky but well worth learning; if you don't want to use it you can ch3 instead). Some stitches need to be worked into back loops; if you're not sure how see this tutorial. US terms are used throughout; if you prefer UK ones please use this conversion chart. Round 4: Ch 1, (sc in back loops of next 2 dcs, 3dcs into gap) 12 times. 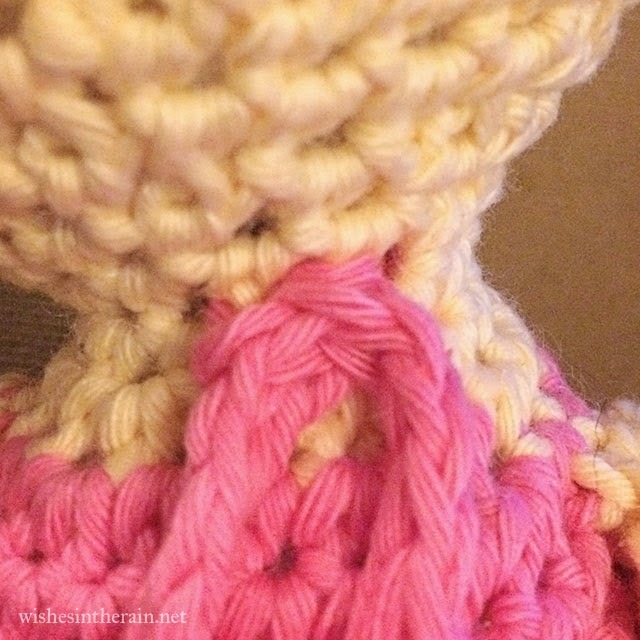 Join with sl st to first sc, bind off and weave in ends. 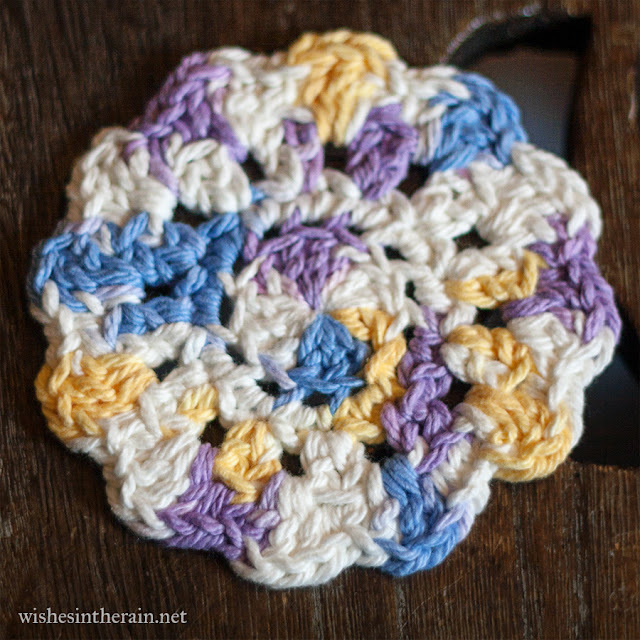 Blocking: When you finish, the coaster will not lay completely flat. Steam blocking will fix this, and only takes a minute per coaster. Lay one coaster upside down on an ironing board, and cover with a clean tea towel. Spray water over the towel, then iron briefly to flatten the coaster. If you have a steam iron you can use that instead of spraying water, and if you don't have a water spray, just dampen the tea towel first. Round 1: Dc 12 times into magic ring. Pull tight and sl st through first dc to join. Round 7: (3hdc into ch2 space, sl st into hdc) 16 times. Bind off & weave in ends. To add the ribbon, turn the holder inside out and weave ribbon in and out through the holes until it goes round one and a half times (so the ends are on opposite sides of the holder). Adjust the ribbon so that both ends are the same length, and turn the holder right way out again. 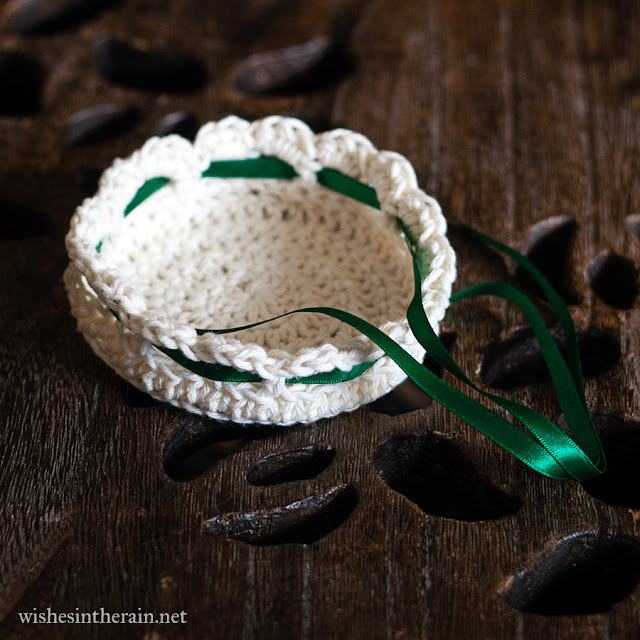 Place the coasters in the holder and tie a neat bow. It's Christian Aid Week this week, and my church held a bake sale to raise money for their valuable work - they work to end poverty across the world by partnering with local organisations who are best placed to help in their communities (regardless of religion, creed or colour). 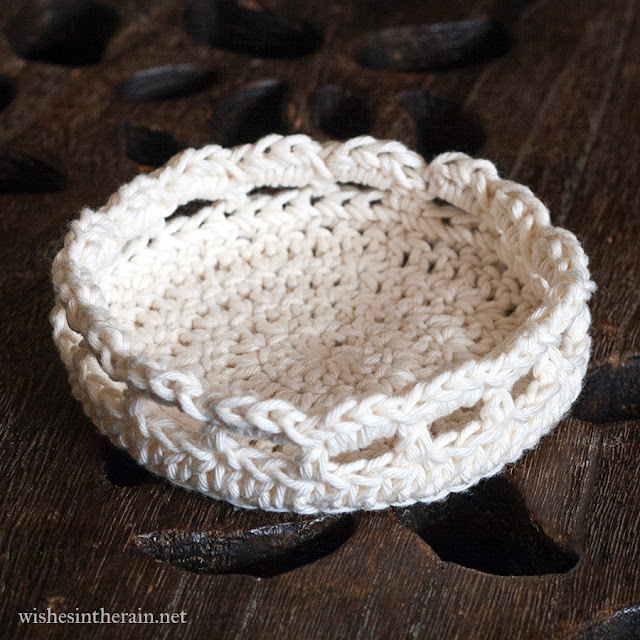 I've been busy with crochet for a few weeks but I can never resist the opportunity to bake! I made some regular red velvet cupcakes, but I thought it would be nice to make something egg, dairy and gluten free too because that way, everyone can have cake that wants it. 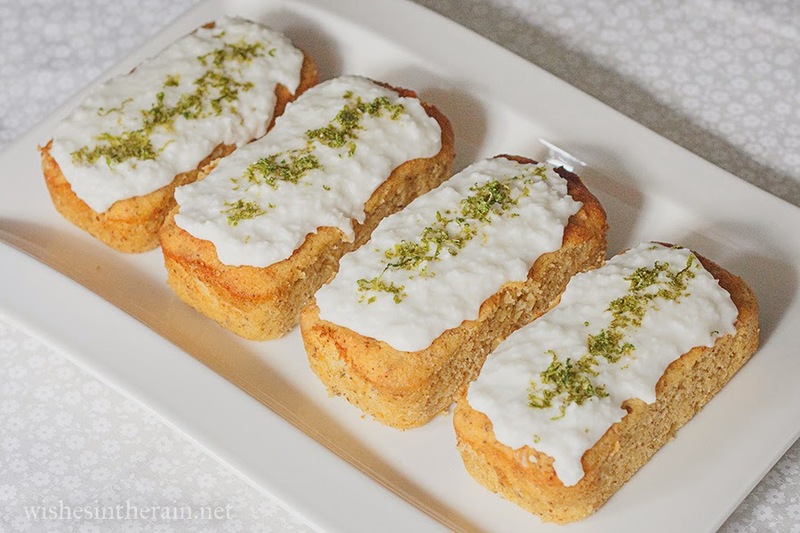 I wasn't sure I wanted to make cupcakes (not least because there's a limit to the number I can transport) but mini loaves seemed perfect - they're the right size to share, and it's easy to make several. 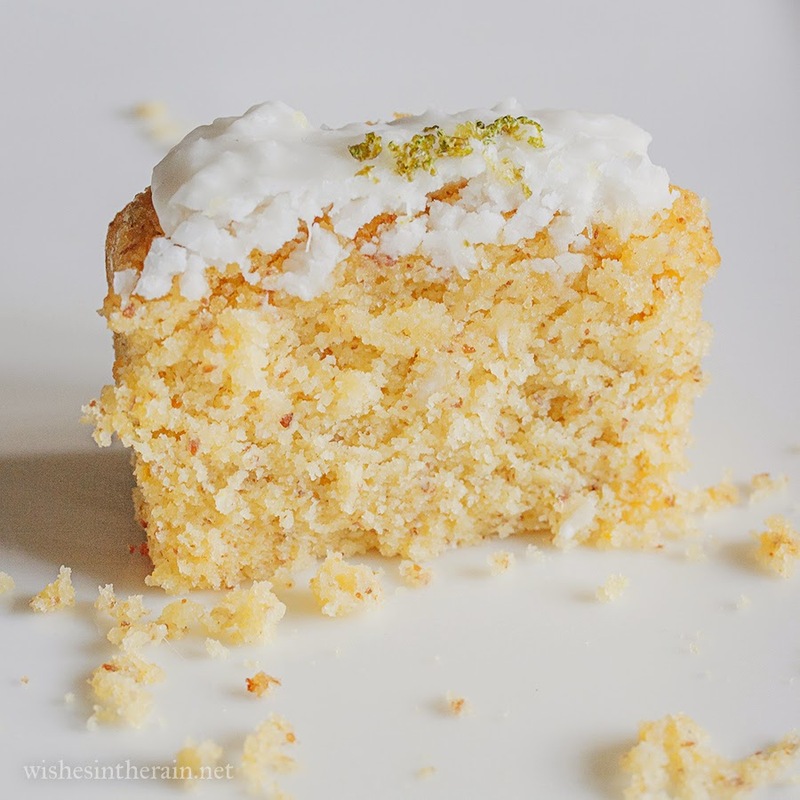 Last year I discovered polenta cakes, and I really like their texture and how they don't have any hint of grittiness that gluten free cakes can sometimes have. But the recipes I had tried up to now had many, many eggs in. I had some flavours in mind when I found this recipe for Flour-free Lemon & Blueberry Polenta Cake. I don't really like blueberries very much, but it seemed like a good place to start. The finished cake was very moist and a bit crumbly. I was pleased how light the texture was, not at all dense, and the lime and coconut flavours came through really nicely. I doubled the original recipe I adapted this from to make five mini loaves. Half of this would fit one 2lb loaf tin. Preheat the oven to 170°C (for mini loaves - the original recipe suggests 180°C for one big loaf) and grease/line your tin(s). Cream the butter and sugar in a stand mixer if you have one, or with electric beaters if not. In a small bowl, use a fork to whisk together the flaxseed and water until it thickens, then add 2 tbsp of the almond meal and whisk until it thickens some more. Add the flaxseed mix to the creamed butter and sugar, and mix until combined. Sieve the remaining dry ingredients (coconut flour, polenta, almond meal and baking powder) together to mix them thoroughly. It doesn't matter if some of the almond meal doesn't make it through the sieve. Add these to the rest of the mixture along with the lime and lemon juice and zest, and mix until combined. Finally, add the coconut yoghurt (or yoghurt and coconut flavouring) and mix on slow until combined. Bake in the centre of the oven for 30mins (45mins for a large loaf) until a tester comes out clean and the cakes have pulled slightly away from the edge of the tin. In a small microwave safe bowl, mix the lime juice and the sugar. Microwave on high for 20 seconds at a time until sugar dissolves with a little stirring. While they're still warm, prick holes all over the cakes and pour the glaze over. 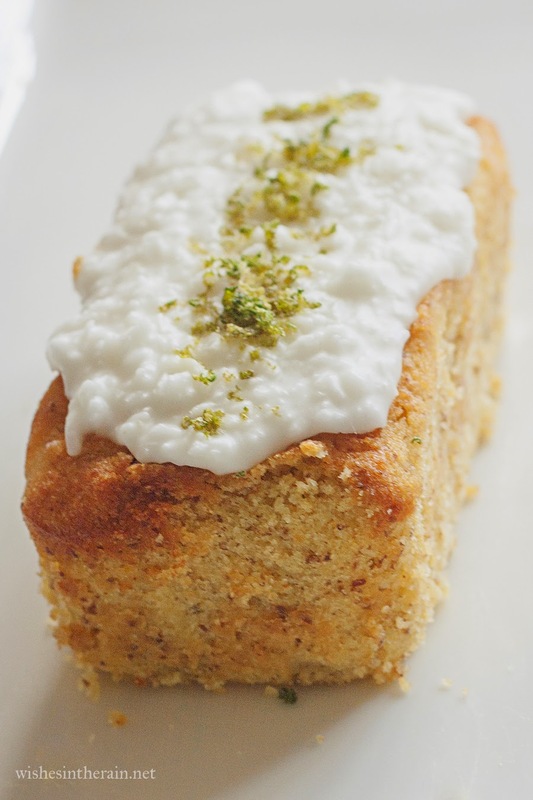 Mix the lime juice and icing sugar together, until smooth. You may need to use more or less sugar depending on what consistency you like for your icing and how juicy your limes are. Mix in the dessicated coconut, and ice cakes. 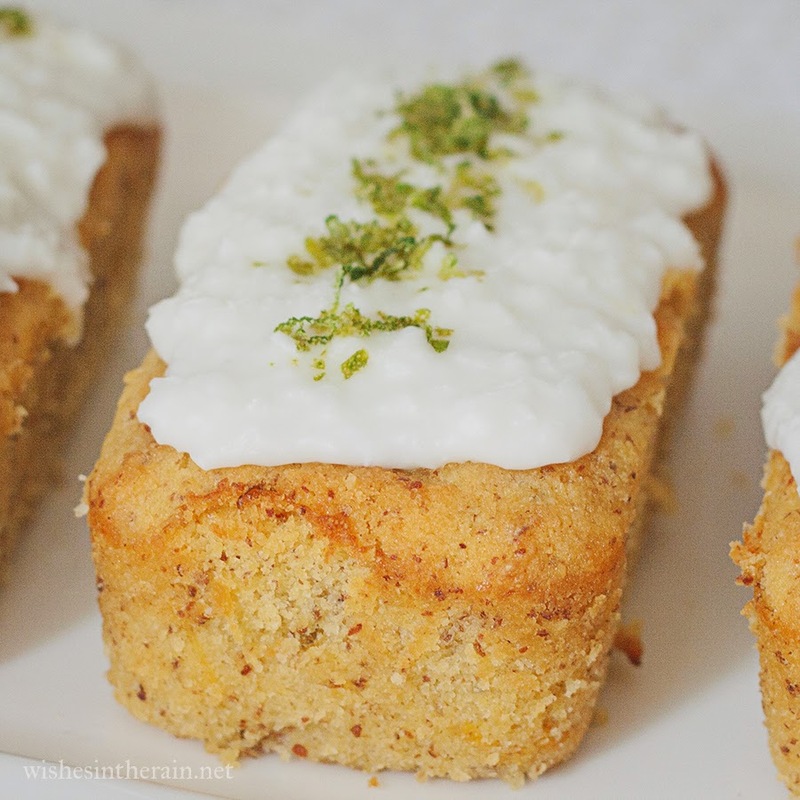 Sprinkle the lemon zest on top of the cakes to decorate. 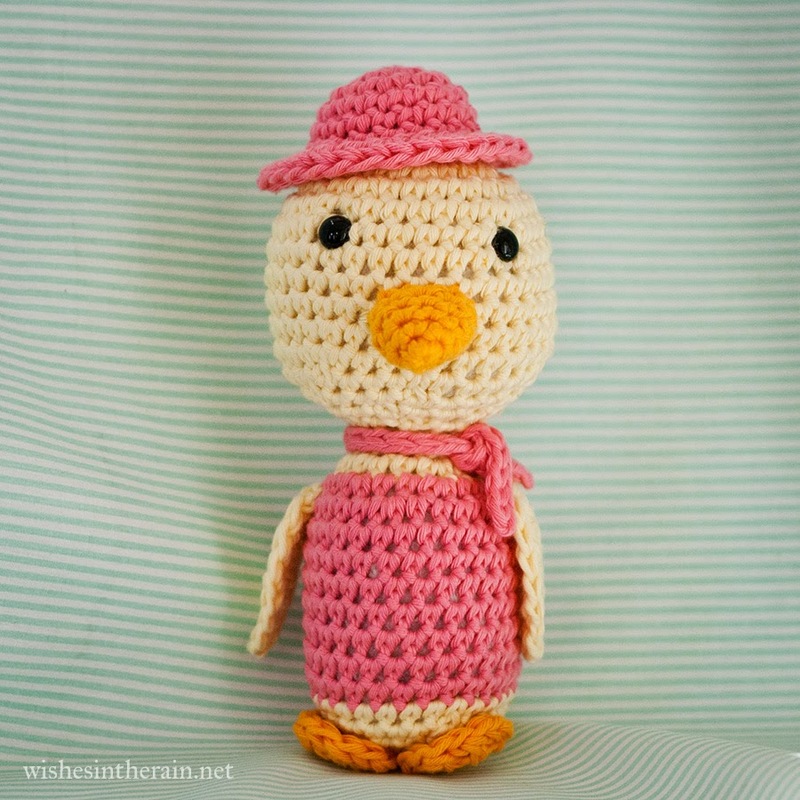 I thought it would be cute to make a little toy inspired by the seagull on the jumper, a little bit like the doll and dress I made for my niece a couple of years ago. I knew a one year old wouldn't appreciate how they match, but his parents would! You can hear the bird sound maker on a little video I put on my instagram account (do follow me there if you'd like to see what I'm currently working on). It makes a squeaky, whistling sound - a nice change from a rattle. 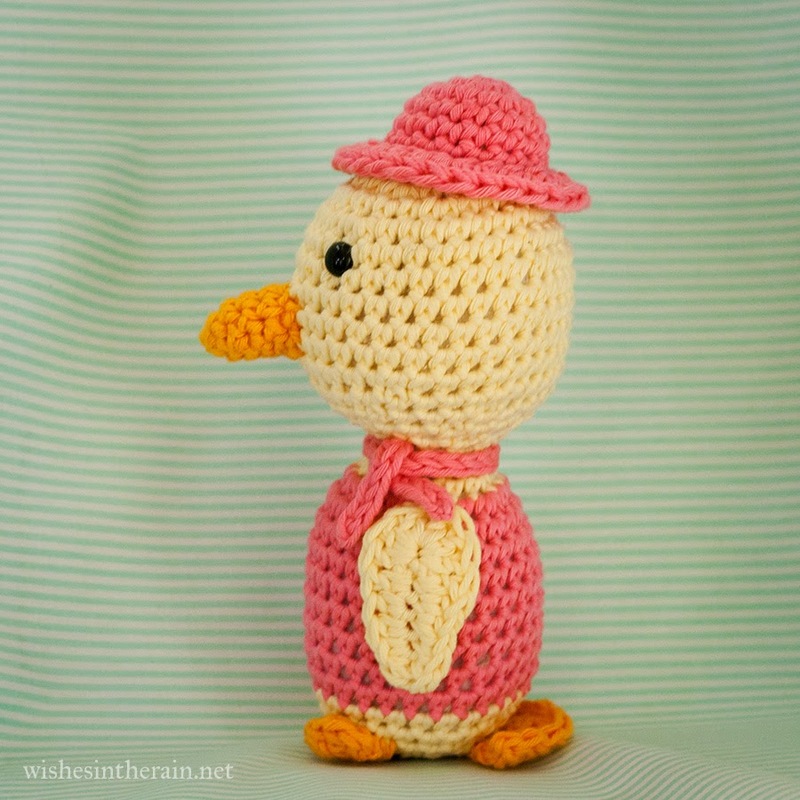 After making a duck for the little yellow duck project last week, I thought it would be a good idea to test the pattern and make another duck at the same time, especially as a girl found my duck and was pleased with it. 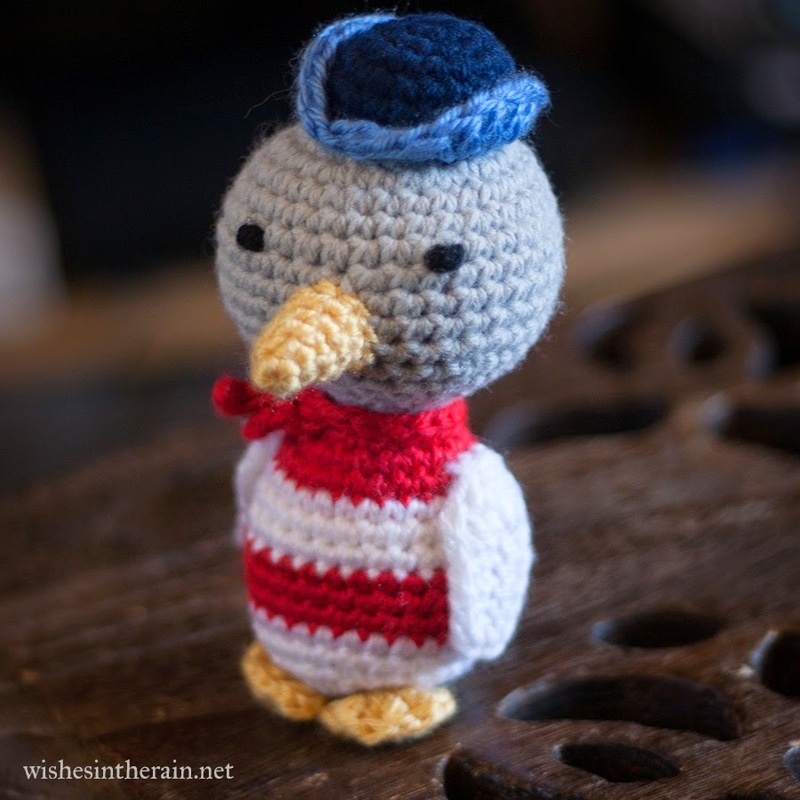 I did a plain 'jumper' style for the duck instead of stripes. 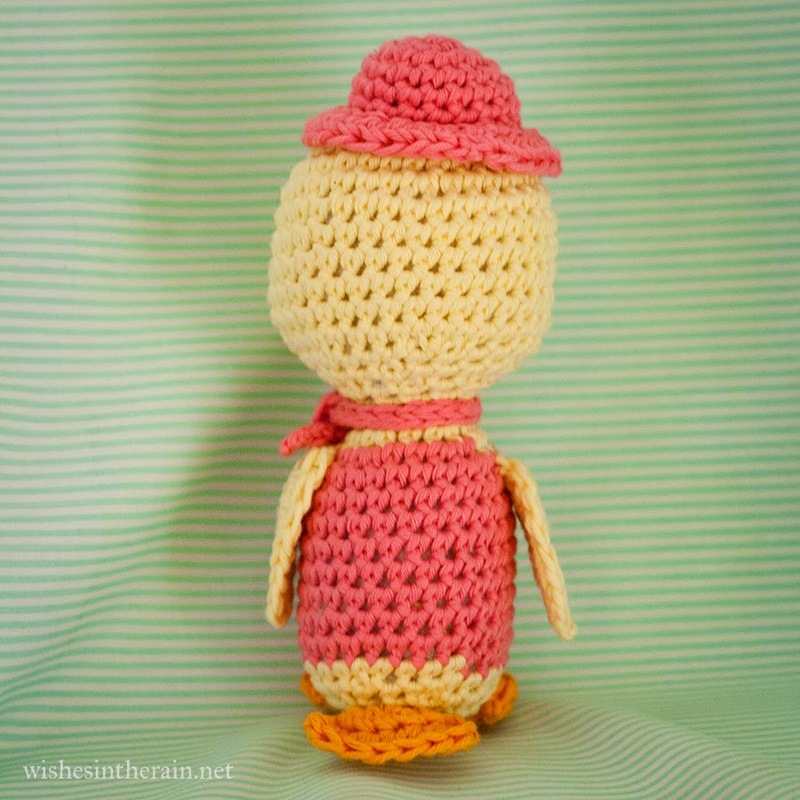 Since the duck isn't a sailor and it's been lovely and sunny here these past few days, I changed up the hat a little to make it more like a sun hat. 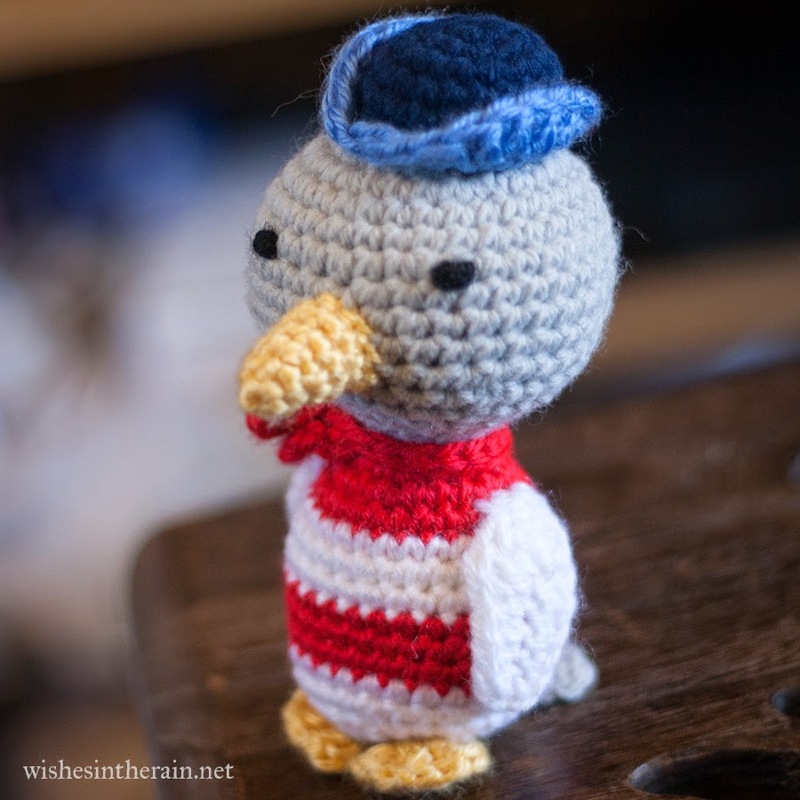 I made the seagull with a 4mm hook and acrylic yarn, and the duck with cotton yarn and a 5mm hook. Stitches used: ch, sl st, sc, hdc, fphdc, dc, magic ring, invdec (invisible decrease - put hook through front loops of next two sts, yarn over, pull through two loops, yo, pull through two loops), inc = 2sc in one st. US terms are used throughout; if you prefer UK ones please use this conversion chart. Unless otherwise noted, the pattern is worked in spirals throughout. 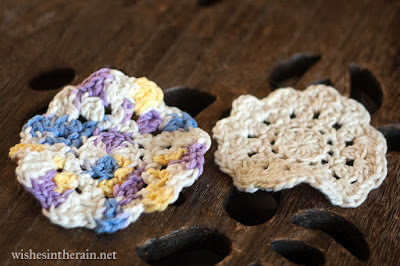 Do not join at the end of a round, but use the stitch marker to keep track of the beginning of the round that you're on. At this point I sewed on the eyes, and made the beak and sewed it on too. You could sew eyes and the beak on after but definitely use safety eyes now if you're going to. Stuff head, Change colour to white. Note that for the body, you may need to change where in a round you switch colour to ensure the changes are at the back of the toy. Rounds should begin and end in marked stitch as usual. Round 33: Invdec in each pair of sts all around (6) bind off and sew shut. Sew end back through body and trim off excess to hide. Round 1: Work 4hdc into magic ring. Pull tight but do not join. Make sure you have enough of a tail to sew to body. Round 3: Ch1, turn, 2 hdcs in first st, hdc in next 4 sts, 2 hdcs in last st. Bind off, weave in end. Round 1: 7 hdcs into magic ring. Pull tight but do not join. Make sure you have enough of a tail to sew to body. Round 2: Ch1, turn, (hdc, fphdc) three times, hdc, bind off, weave in end. Ch7, Sc in 2nd ch from hook, sc, 2hdc, dc, dc6 into last ch. Working down the other side of the initial chs: Dc, 2hdc, 2sc, sl St into 1st chain, bind off, leaving tail to sew to body (you'll need to weave the tail back through the wing first). Rounds 5, 6, 7: sc in each st around. Bind off. Bind off, leaving tail to sew to head. 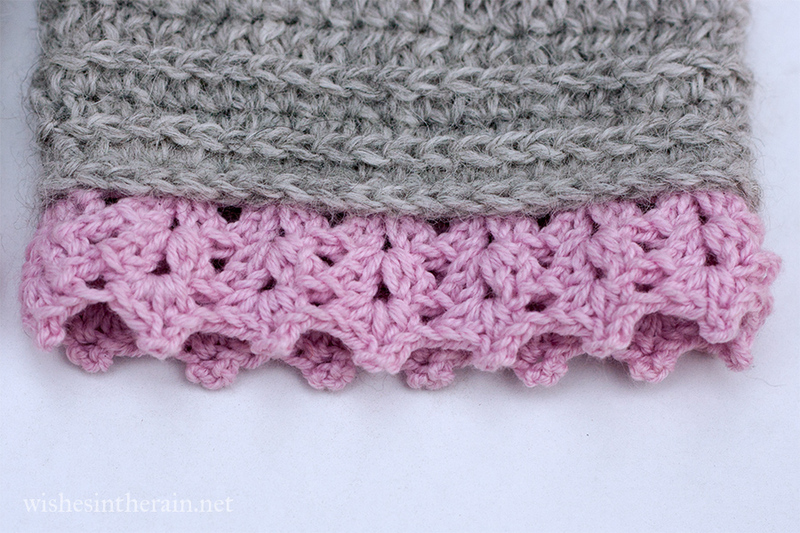 Rounds 1-7: as above but don't bind off or change yarn. Turn. Round 9: Ch 1, (hdc in 5 sts, 2 hdc in next st) four times. Bind off, leaving tail to sew to head. Row 2: Sl st in 2nd ch from hook, and next 13 chs. Sl st through both next ch and post of st at the back of where the head and body join twice to attach the scarf at the back. (See image below - you can skip this if you'd prefer to just sew the scarf). Sl st into remaining sts & bind off. 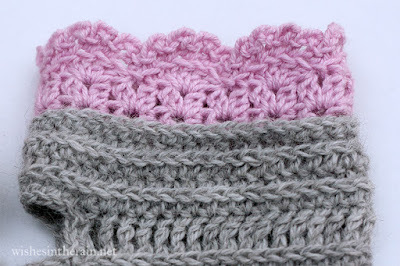 Style the scarf as you like and sew in place with ends of yarn. Stuff hat and sew hat to head. I put most of the stuffing in before sewing the hat but I stuffed it a little more before sewing it closed. Positioning is up to you, but I think it looks cute slightly off to one side. Sew wings to body with the round side at the top. You can sew all the way round or just at the top and leave the rest of the wing loose. Sew feet next to each other to the base of the body. Sew tail to the back of the body at the bottom. 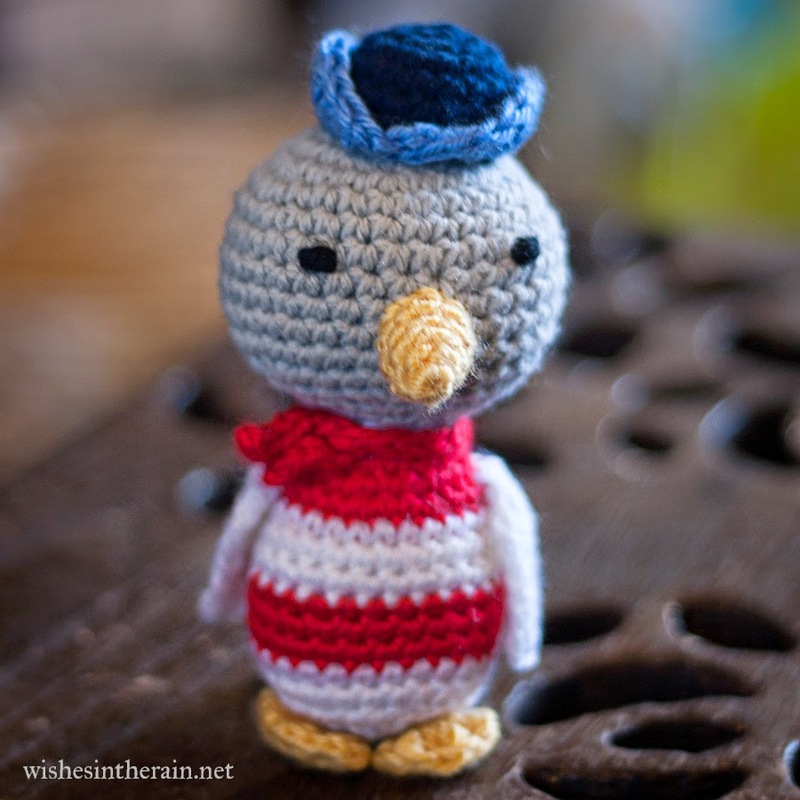 Weave in any ends that are left, and enjoy your little bird!